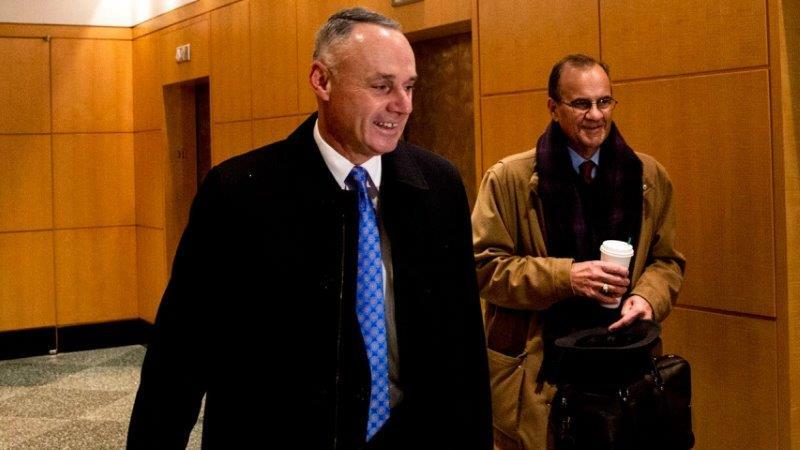 Rob Manfred, accompanied by vice president of baseball operations Joe Torre, walks into work Monday. NEW YORK -- Rob Manfred's first day in the office as Major League Baseball's 10th Commissioner was, well, normal. "It has been more routine than I would have expected, in the sense that I'm just dealing with the kind of everyday issues that come along," Manfred said on Monday afternoon. Perhaps that's because this first day was four months in the making. In that time, Manfred came up with an agenda for his first 100 days. One of the advantages of a lengthy transition period was that Manfred had the opportunity to begin work on his agenda. "Big pieces of my 100-day plan we've already rolled out," he said. "For example, we've completed the study of what the current youth market looks like. We've already developed a strategy on how we're going to try to engage in that space. We've already done some public things." One of those was Manfred's appearance at an American Baseball Coaches Association convention earlier this month. "I thought it was important for the Commissioner to show up," he said. Manfred grew up both a baseball fan and a player. Like his predecessor, Bud Selig, he watches hundreds of games a year. He long ago fell in love with the game itself and with how incredibly gifted the players are. "It's an everyday consuming engagement between the game and the individual fan," Manfred said. "And the sense of responsibility I feel is to maintain baseball's place in our culture. I want to grow the game. I want to generate more revenue. I want to try to have a system that makes the game profitable for the owners and good for the players. But I also want to -- always, always, first and foremost -- maintain the special place that baseball has within our culture."